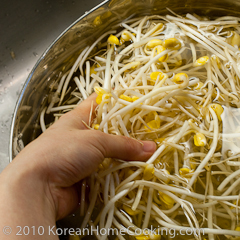 Wash the bean sprouts in water and drain. 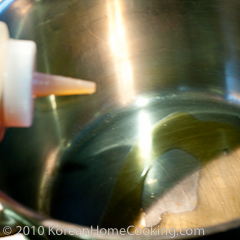 Heat a pot over medium heat and spread a tablespoon of sesame oil. 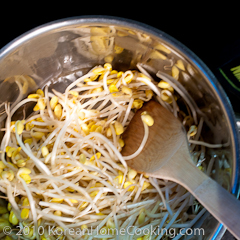 Stir-fry the bean sprouts in sesame oil. It should sizzle. 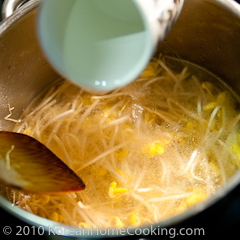 When the bean sprouts are half way cooked, add water and bring to boil. Cook for approximately 5 to 10 minutes. 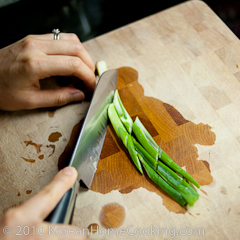 Cut the scallion into 1 to 2 inches long. 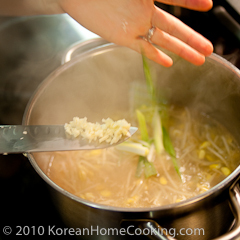 Add the scallion and garlic to the soup and boil for another minute or so. you were close. 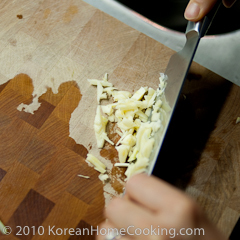 this is called "콩나물국". 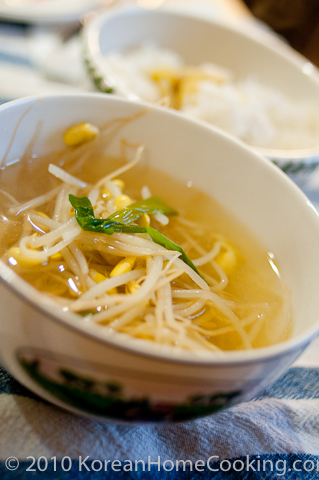 "국" means soup and "국수" means noodle soup. am I just really blind, or did you not specify when to add the salt? or was that an optional "to taste" ingredient for when we've finished making it? I will definitely try this one. I always love your weblog for those fantastic recipes you're sharing. The recipes which you are sharing may be very tasty and additionally easy to make. keep sharing such unique recipes. Your dishes are very attractive and looks yummy.